DETROIT (AP) — A runaway title in a division of behemoths, then an unexpected sweep against a trio of Cy Young winners. For Nelson Cruz, Buck Showalter and this unheralded bunch from Baltimore, the question now is: What’s next? Cruz sliced a two-run homer for his latest big postseason hit, and the Orioles held off the Detroit Tigers 2-1 Sunday to reach the AL Championship Series for the first time since 1997. Bud Norris outpitched David Price in Game 3 of the AL Division Series. The Tigers scored in the ninth inning and put the tying run on second with no outs, but Orioles closer Zach Britton escaped the jam to lift Showalter into his first LCS in 16 seasons as a big league manager. 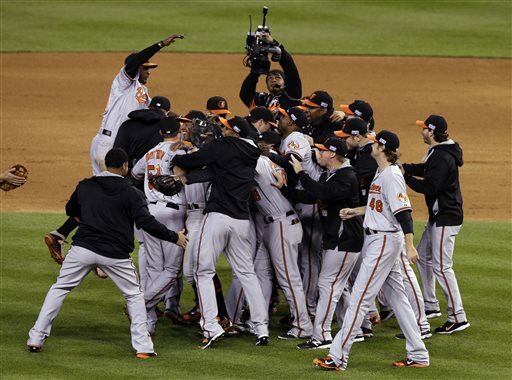 Baltimore opens the ALCS on Friday at home against Kansas City. The Royals won the season series 4-3. So often an afterthought in the rugged AL East, the Orioles won their first division title since 1997 this year, dispatching the second-place New York Yankees by 12 games — and last-place Boston by more than double that margin. That put Baltimore up against another of the game’s most star-laden rosters, and Miguel Cabrera, Justin Verlander and the Tigers couldn’t manage a single win. Cruz’s homer Sunday was his 16th in postseason play, including eight against the Tigers. He was the MVP of the 2011 ALCS for Texas in a six-game victory over Detroit. Cruz spent much of this past offseason without a team after serving a 50-game suspension last year for violating baseball’s drug agreement. Norris pitched two-hit ball for 6 1-3 innings, and Andrew Miller got five straight outs to keep the shutout going. Victor Martinez and J.D. Martinez opened the ninth with back-to-back doubles off Britton. Bryan Holaday struck out after a failed bunt attempt, and Showalter made the unconventional decision to put the winning run on base by intentionally walking Nick Castellanos. That meant the bottom of Detroit’s lineup would have to come through. The Tigers sent up Hernan Perez — who had five at-bats in the regular season — to pinch hit, and he bounced a 96 mph fastball into a 5-4-3 double play. It was Britton’s second save of the series. Cruz led the majors with 40 homers this season, and the Orioles topped baseball with 211. It was his two-run homer in the first inning of the opener that set the series’ tone, and he came through again in the sixth inning against Price. Cruz’s drive cleared the wall in right, about 2 feet to the left of the foul pole. Not bad for a guy the Orioles signed in late February. Cruz turned down a $14.1 million qualifying offer that would have kept him with Texas — but he ended up having to settle for an $8 million, one-year contract with Baltimore that included $750,000 in roster bonuses. Cruz’s powerful bat enabled the Orioles to withstand season-ending injuries to Manny Machado and Matt Wieters, as well as Chris Davis’ 25-game suspension for an amphetamine violation. “If you tell me before the series we’re going to sweep, I don’t believe it,” Cruz said. Detroit won its fourth straight AL Central this year. But after reaching at least the ALCS the last three seasons, Detroit couldn’t make it there this year. The Tigers remain without a World Series title since 1984 — a drought one year shorter than Baltimore’s. “It’s disappointing. You feel like you let the fans down and you feel like you let the organization down,” said Brad Ausmus, who replaced Jim Leyland as Detroit’s manager after last season. Detroit acquired Price at this year’s trade deadline, adding another impressive arm to an already-formidable rotation. Max Scherzer, Price and Verlander are the AL’s last three Cy Young Award winners, and the Tigers started them all in this series. Verlander and Cabrera have combined for the last three MVP awards. No use against a Baltimore team that had already surprised most of baseball with a 96-win regular season. After dropping the first two games of the ALDS in Baltimore — the second thanks to an eighth-inning collapse by the bullpen — the Tigers returned home to a fairly subdued crowd at Comerica Park. In the third, Don Kelly was on second with one out when Torii Hunter hit a grounder to the left side. Kelly was caught between second and third and tried to slide headfirst back to second. Second baseman Jonathan Schoop initially dropped the throw from shortstop J.J. Hardy, then quickly picked up the ball and tagged Kelly. An umpire supervisor said through Major League Baseball spokeswoman Phyllis Merhige that Schoop was still in the act of fielding the ball, so it was not obstruction. Detroit OF Rajai Davis was out of the starting lineup with a pelvic strain. He lined out as a pinch- hitter in the seventh. Tigers C Alex Avila left in the sixth after taking a foul ball off the mask. Baltimore reached the ALCS in 1996 and 1997, losing to the Yankees and Cleveland. The Orioles went 3-4 against Kansas City this season and 4-2 against the Angels.